From the west on the A31 at the junction with the A338, continue on A31 and look out for the brown-signed exit to Moors Valley on the left. From the east on the A31, at the A338 junction at Ashley Heath, take the slip road up to the roundabout and return east on the A31. Immediately look out for the brown-signed exit to Moors Valley on the left. 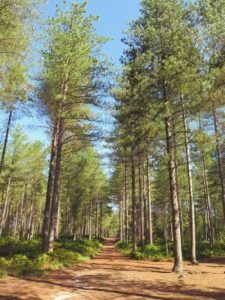 Moors Valley Country Park is set in a large pine forest. This has a good path network to allow plenty of scope for a permanent course, the maintenance of which is the responsibility of our sister club Wimborne Orienteers. Course lengths of 1.5, 2.7, 2.8 & 6.4 km are available. Map packs cost £2.00 and are from the Information Point in the Visitor Centre. The park rangers are trained orienteering instructors and will take groups of youngsters/oldsters if booked ahead. The park is open all the year, parking is extensive and costs vary through the year. Charges are £2.20 for 2 hours and £4.50 for 4 hours. These charges rise to £4.50/£7.80 from 1st July to 2nd Sept. Excellent toilets and café in the visitor centre. This a very popular park with large numbers of giant sized wooden animals to climb over and through, a tree-top walk, high ropes, rides on a miniature train etc. The crowds tend to keep to the popular areas and the orienteering is along quiet secluded paths in the forest. This environment represents a definite progression from park orienteering towards the ‘real thing’. You will need Adobe Reader to view and print these files. If you need to download Adobe Reader click here. This may take several minutes. When printing the map from Adobe Reader, select Portrait and Page Scaling as NONE. The leaflets can be printed in Portrait with Page Scaling set to ‘Fit to Margins’. The website of Moors Valley Country Park.